Pre-heat a griddle or cast iron skillet over medium-high heat. Place the celery and scallions in a bowl of ice water. In a small skillet, heat the EVOO, five turns of the pan, over low to medium-low. Add the garlic in a single layer and cook until light golden, 3-5 minutes. Using a fork, transfer the garlic to a paper towel. Pour the EVOO into a small dish and let cool. Pat the steaks dry, brush with the garlic-infused EVOO, then season with kosher salt, pepper and rosemary. Add the steaks to the hot griddle and cook, turning occasionally, to desired doneness, 10 minutes for medium-rare. Sear the edges; transfer to a cutting board and let rest for 5 minutes. Slice the steaks crosswise against the grain. Douse with the juice of half a lemon; sprinkle with sea salt. In Recipes-list.com we have selected the most viewed recipes from category - uncategorized . Enjoy the best recipes specially selected for you! 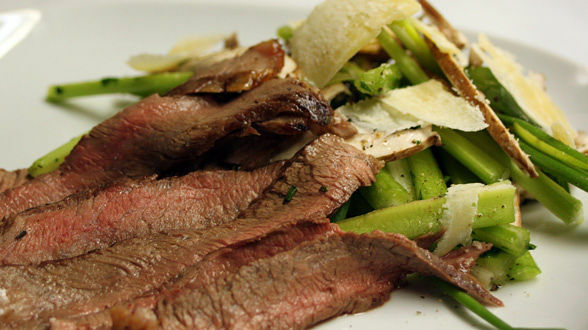 Tagliata with Celery and Mushroom Salad is the right choice that will satisfy all your claims.